A finished cheese board sits on a table at Tria. Cheese can be a snack, an appetizer — even an elegant dessert. But it shouldn't be intimidating. And, experts say, putting together a restaurant-quality cheese board shouldn't be intimidating, either. Claire Adler, cheese director for Tria restaurants, said at-home entertainers need not be discouraged by photos of lavish displays they see on Pinterest. 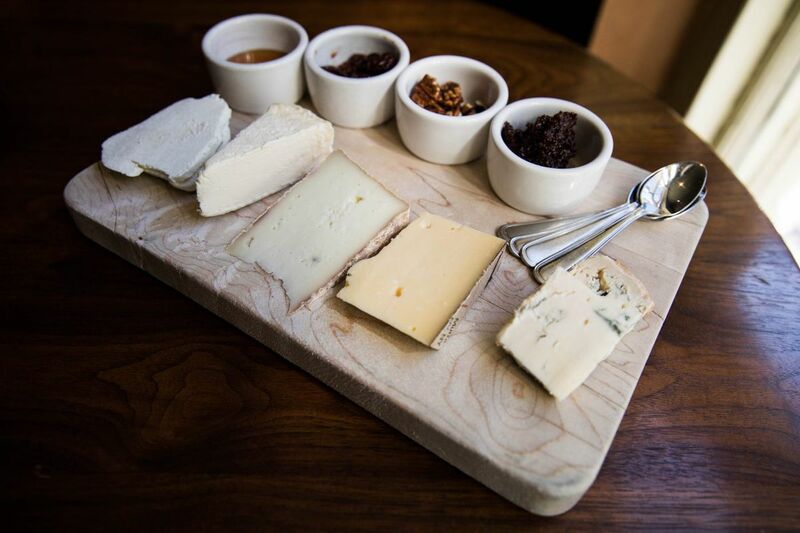 Composing a cheese plate, she said, can be simplified by following a few guidelines for navigating the infinite number of cheeses and condiments available in stores and at farmers' markets. Adler recommends a minimalist approach. Five cheeses, four condiments, maybe sliced bread on the side. "You see a lot on Instagram of these beautiful cheese boards stuffed with fruits and nuts and jams," she said. "I like fresh fruit, too, but sometimes it can distract." She prefers a tidy board with contained garnishes that let the cheese take center stage. "I just think it's nicer for the cheeses," she said. A finished cheese board at Tria on Rittenhouse Square. Hunter Fike, merchandising and category manager at Di Bruno Bros., said a cheese plate should have at least three options, ideally five to cover all the families: a fresh cheese, meaning one that has not been aged; a washed rind ("stinky" to some); a medium-aged; one firm or hard selection; and an aged variety such as Gouda. Adler said five is the magic number because it doesn't overwhelm. "I think that once it gets to be more than five, you're not really paying attention," she said. "It gets harder to remember what you enjoyed." Cheese should be stored in parchment paper or cheese paper, never in plastic wrap or Ziploc bags, because those don't let the cheese breathe, Adler said. Blue cheese should be stored in foil to contain the mold. Cheese is best enjoyed at room temperature, Adler said, in portions allowing for about one ounce of each cheese per person, unless the platter offers more than five choices. Cheeses are typically arranged from mild to wild so the intensity builds. Adler started with a light chèvre, a goat cheese with a fluffy texture and a hint of fresh lemon. She chose Westfield Farm Capri from Massachusetts, but said substitutes like Shellback Sharp and Vermont Creamery's fresh chèvre are carried at Di Bruno Bros., Whole Foods, and other stores. Fike started with burrata, a fresh cheese that is essentially a shell of mozzarella wrapped around whipped mozzarella. "You could call burrata 'mozzarella squared,' " he said. Adler's second selection was a cremeux de Bourgogne, a triple créme Brie-style cow's milk cheese from France. Many triple crémes can be found locally, such as the delice de Borgogne, available at Di Bruno's. The cheese is silky and a little sweet, and oozes when cut. "I always tell people to embrace the messy, especially with a triple créme," she said. "There's no neat way of doing it." Fike next recommended Taleggio, a semisoft cheese with some funk and undertones of mushroom that can even be used in a grilled cheese sandwich, followed by raclette, cheese with a pliable texture that goes with most condiment pairings. For her third cheese, Adler chose a wedge of pepito, a goat's milk cheese studded with whole peppercorns, from Yellow Springs Farm in Chester Springs. It might not always be available, so Adler said any other tomme or tomme-style cheeses would work as substitutes. To get the peppercorn flavor, she suggested a trip to the Italian Market for Pecorino pepato, a crumbly sheep's milk cheese. Dutch Gouda cheeses are crowd-pleasers, Adler said. Her choice is Klaverkaas Estate, but her favorite substitutes are Isabella, Boerenkaas, Marieke, Prima Donna, and the locally produced St. Malachi from the Farm at Doe Run, all available at stores like Whole Foods. Fike suggested L'amuse Gouda, the top-selling cheese at Di Bruno's, for its crunchy, sweet, faintly caramel flavor. Adler's final selection was a salty, smooth Gorgonzola cremificato from Italy, an accessible introduction for those who might not normally like blue cheeses. For similar "gateway" blues, she suggested exploring the Italian Market or Gorgonzola dolce from Di Bruno's, which has a fudgy texture that appeals to a range of palates. Fike's final choice was Chiriboga blue, a German attempt at making Roquefort that turned into something sweeter, with hints of vanilla. He said it pairs well with Di Bruno's cocoa-and-cinnamon-seasoned pecans, but that they are second to the best condiment: meat. "We hear people ask for jam, but the No. 1 go-to is actually charcuterie," he said. "Some sliced salami, some ham. Those salty flavors." Meats aside, Fike recommended fig jam as a versatile seasoning for cheeses salty and sweet. For the same reason, Adler said she would never have a cheese plate without honey. Fig jam would complement blue cheese or Taleggio, both said. Most cheese is salty and fatty, so a sweet taste helps break that down. But it also adds to the flavor of sweeter cheeses. Adler suggested using cherries poached in beer, or another type of fruit compote or chutney. She'd pair the fruit with the Brie-style cheese, because it's the fattiest cheese and the sweetest condiment. Adler paired candied pecans with the chèvre, honey with the pepito, and cherries with the Gouda. Fike said Di Bruno's Black Lava cashews, toasted in toffee and sprinkled with Hawaiian salt, complement Gouda's taste as well. No fancy cheese tools are required for serving, Adler said, just a few sharp knives. The only tool she recommended was a cheese wire to slice through softer cheeses, making a clean cut with minimal surface contact. Even dental floss would work as a substitute, she said, provided it's unscented. Cut along the natural lines of the cheeses as a rule, Adler said, making slices out of a wheel of cheese, carving crosswise pieces out of a wedge, and long, narrow slices out of softer, pie-shape cheeses. That means no cutting the nose off the end of a slice of Brie. "Please don't do that," Adler said. Want to add a charcuterie board to the table? Try these tips, courtesy of Claire Adler and the rest of the Tria staff. Capocollo, or coppa, whole-muscle pork that can be hot or sweet. Chorizo, spicy Spanish pork sausage that is best served in coin-shaped slices. Terrine or pate. Whether it's pork, lamb or chicken, choose one with a firmer texture so it can be used as a cracker for layering cheese on top. Speck from Alto Adige. This slightly smoked cured ham can be found at Claudio's in the Italian Market. Prosciutto di Parma, a classic dry-cured ham. Serve with cornichons or capers, and some whole-grain mustard, because charcuterie needs acidity to cut through the fat.